← Dyne Pens & Test Fluids – How do they work? 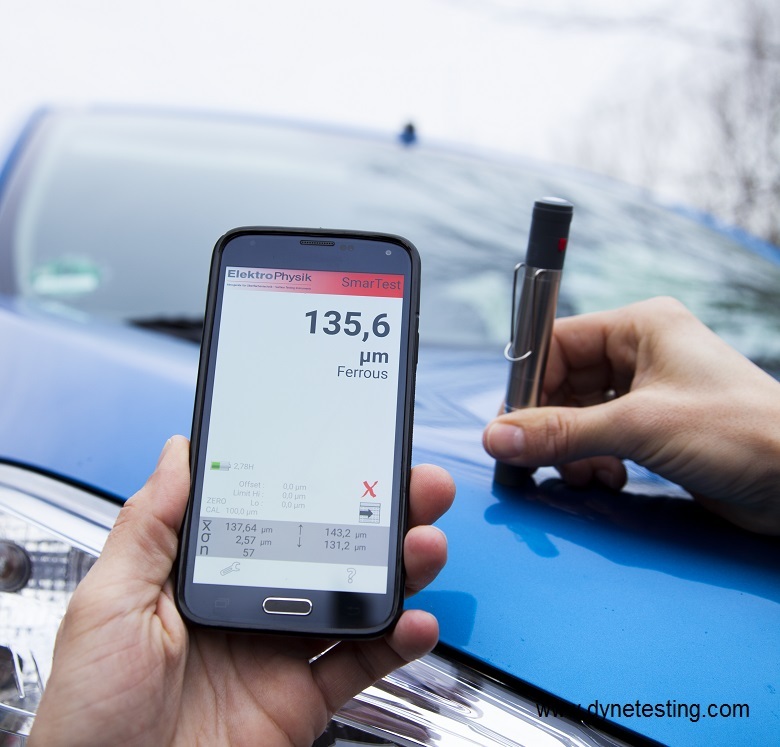 The innovative SmarTest intelligent Bluetooth™ sensor is quickly becoming the preferred choice of coating thickness measurement tools for Quality Assurance in the Coatings Industry and is now available in the UK and Ireland from Dyne Testing Ltd. This sleek, hand-held instrument is the size of a thick ballpoint pen and weighs a mere 50g. Paired with your iOS or Android® smartphone or tablet you can carry your SmarTest with you anywhere and take measurements whenever you need to. The instrument not only looks good but is very easy to use. Simply download the SmarTest App onto your phone or tablet and follow the on-screen instructions. The SmarTest App can automatically recognise the type of substrate whether ferrous or non-ferrous and will display readings of the current measuring value, statistical evaluation and helps store control and calibration of the sensor. Data can be stored on your device, downloaded to your PC or e-mailed as required. Now here’s the clever bit. The SmarTest can be supplied with any of the SIDSP® sensors that cover a wide range of typical and different applications. Thanks to the use of the most advanced technology, these interchangeable sensors are not susceptible to interference and provide an excellent measuring accuracy. Variations in temperature will not affect measurement and readings remain stable to ensure good reproducibility over the complete measuring range. In addition to the comprehensive range of standard sensors, there are several special sensors for particularly difficult applications available e.g. the HD-sensors are designed for heavy-duty use in tough environments, the sensor electronics being protected against dust, paint or other aggressive substances. Further information on the most intelligent wireless coating thickness sensor can be found here or you call our sales team directly on 01543 411460.